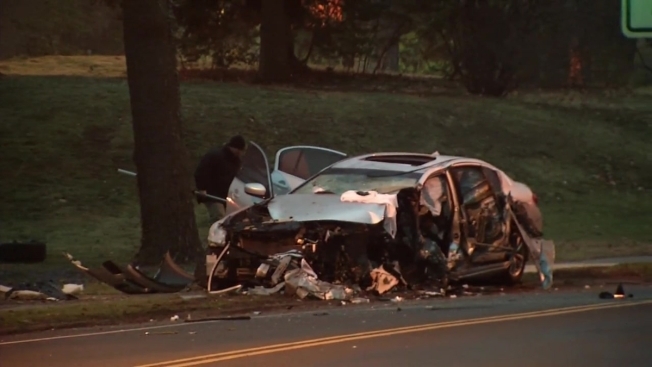 Police Investigate 2 Fatal Crashes in Hartford, Conn.
Police are investigating two fatal crashes in Hartford. Police were called to Asylum Avenue around 1 a.m. after an Infinity hit a curb at Woodside Circle. A male victim was pronounced dead at the scene and a female who was in the vehicle was taken to St. Francis Hospital. Part of Asylum Avenue is closed and police are asking people to avoid the area. Use Farmington Avenue or Route 44 instead. A couple hours later, police responded to a crash at Wawarme Avenue and Colt Park and said one man is dead after a car jumped a ravine. Police said it appears that the car went down Ledyard Street, jumped a ravine and went 15 to 20 feet before landing in the park. One person is dead and two others were taken to the hospital, police said. The two male passengers who survived were brought to Hartford Hospital. Deputy Police Chief Brian Foley said those victims were alert and conscious and cooperating with investigators.